So it was with my idea of sharing my mother in law's journey with Alzheimer's. I knew it was necessary for me to put those words to paper as my husband and his siblings could not. They were wrought with pain and anguish as they watched their beloved mother slip away. In the interim of writing this book and sharing the story with others, I finally realized that if others could know they were not alone and if they were aware of some of the nuances of the progress of this disease, perhaps, possibly, just maybe, their journey would be significantly less difficult. So, with that in mind, please share Betty's journey with others. The book will be ready for purchase January, 2015, available from Amazon, and also directly from the author, yours truly. Email us at masabitherpist@gmail.com for your ticket to understanding and a book to be cherished for many years to come. 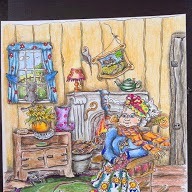 You can see by the picture that Grandma is happy; nevertheless, her mind and environment are quite hectic, misunderstood, and lopsided. That's fine with Grandma! Thanks to Joann Sands of the UK for helping with this amazing project.